PA1ED Radio Amateur Projects: My first Bitx20: Bitx20, one step further! My first Bitx20: Bitx20, one step further! Yesteday was Easter holiday, so I decided to build on my project again. I have cut two pieces of PCB to create the front and the back of the project. In the front there is room for a signal meter, mic. jack, on/off switch, volume potmeter and the Si5351 VFO. On the back I drilled a hole for the antenna connector, and a hole to put the 12V dc power cable thru. Just like all my HF-projects I used a SO259 female socket for the antenna connector. I made the connections from the SO259 and the input of the Bitx20 using RG174 coaxial cable. 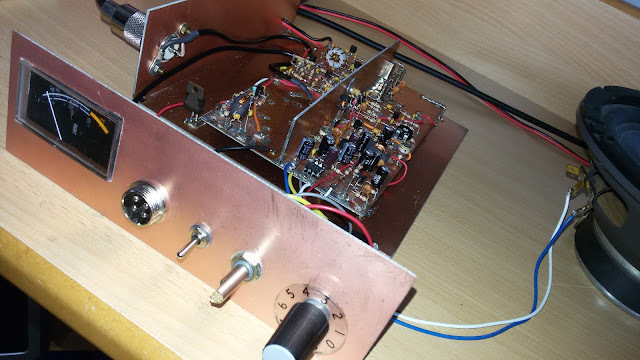 Keep in mind that I didn`t build the bandfilter yet, so the RG174 is connected to the 3th bi-directionel amplifier of the rig. When I was connecting the Si5351 VFO to the Bitx, I ran into a small...minor...actualy no problem. The VFO uses 5Vdc, and the Bitx20 uses 12Vdc. So, I looked in my box of desolderd used components and found a 7805. I soldered it on the +12v rail, ground and connected the 5V output to the VFO. You can see the 7805 on the PCB in front of the SO259 antenna connector. So, the VFO has power and the VFO-output signal was connected to the Bitx20 HF-mixer, (you know? the one with only one transformer!) by using the same RG174 coax cable. Time to test the rig. As soon as I turned it on, I heard a lot of activity. There was a contest on the band, so I could test the Bitx20 very well. It was very interesting to hear all kinds of QSO`s on the 20meter band, but also the beeps on 10.000MHz (my IF on this project) and some radio broadcast stations because the bandfilter is not there. The VFO runs from 4.000MHz till 4.350MHz. You can add this signal to the IF of 10.000MHz. So I can receive all activity between 14.000MHz and 14.350MHz. But, ....there`s always a but. The VFO signal is not only added to the IF frequency. It is also extracted from the IF frequency. So, I also receive activity on (VFO 4.000MHz~4.350MHz) - IF 10.000MHz = 6.000MHz~5.650MHz. Now you know why I receive not only amateurs on 20 meter, but also some other signals and harmonics because the bandfilter is missing. Hopefully my parts for the bandfilter arrive soon.